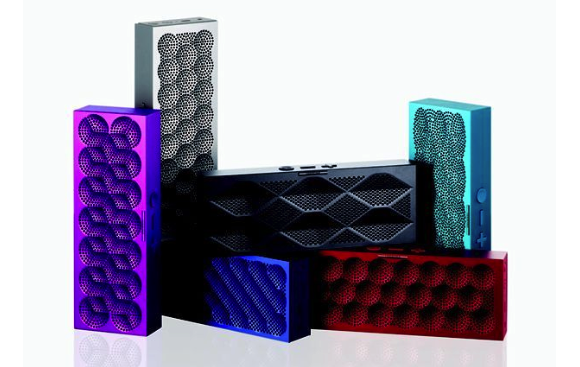 Jawbone’s $180 Mini Jambox portable Bluetooth speaker is confusing at first. It’s taller than the original Jambox, but still much smaller overall, and it’s the same price as the standard version. So what’s the difference, and who should buy this slim speaker? The simple answer to the second part of that question is that anyone considering the original Jambox should buy the Mini Jambox instead. The Mini Jambox sounds a whole lot like the original version of the speaker, with no significant trade-offs—and it’s considerably more portable, to boot. The Mini Jambox measures a bit over 6 inches wide, about 2.3 inches tall, and just under an inch thick. That makes it about the same width as the standard Jambox and barely taller, but the Mini is a dramatic 1.2 inches thinner. On top of that, the Mini weighs only half a pound—about a third less than the original Jambox’s weight. Jawbone is hoping you’ll think this new miniaturized version qualifies as pocket-size—the company pitches the Mini Jambox as something you’ll tote around each day with your phone and wallet. The speaker is certainly rugged enough that I’d feel comfortable tossing it into my backpack, but I think I’d cram it into a pocket only if I knew I’d be needing it. The device is still not small enough for me to make it part of my everyday pocket essentials. One decided improvement over the original Jambox is the Mini’s addition of two tiny feet. The classic Jambox was prone to shimmying across whatever surface it was sitting on—and sometimes scooting off that surface—when playing at louder volumes. Unless I intentionally placed the Mini Jambox halfway off an edge, it stayed put, regardless of the volume level. The top edge of the Mini Jambox hosts three buttons: play/pause, volume up, and volume down. Conveniently, the play/pause button works just like the inline button on Apple’s headphones: Pressing it once toggles play/pause, quickly pressing it twice skips forward, and quickly pressing it three times skips to the previous track. On the right side are a glowing power button, a Bluetooth-pairing button, a Micro-USB port for charging the speaker and syncing with Jawbone’s website, and a 1/8-inch (3.5mm) auxiliary-input jack for connecting a wired source. The speaker ships with a Micro-USB-to-USB cable and an 3.5mm audio cable. The Mini Jambox sounds a lot like the original Jambox. And that’s a good thing—the original Jambox sounds nice. The biggest difference to my ears is that, as you might expect, bass presence on the little guy isn’t as noticeable as on the original. It has some oomph, and you can certainly feel the Mini Jambox kick when you turn the speaker on or hold it in your hand, but don’t expect any significant thumping. Bass aside, the Mini Jambox plays as loud as the original does. 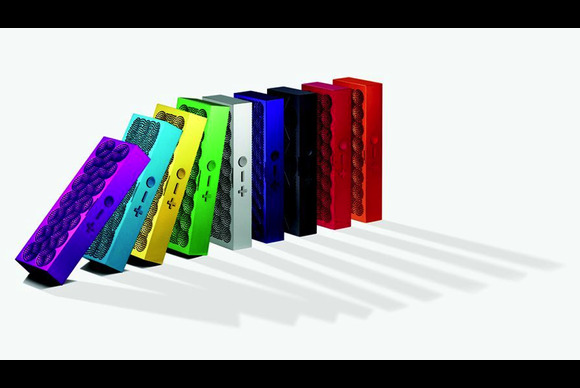 Jawbone reps told me that the company believes that the Mini Jambox sounds louder because of its shape and acoustic trickery. That’s especially true when you use the Mini Jambox’s Live Audio mode. This software plug-in—which you must download and install from the Web by connecting the speaker to your Mac or PC via the Micro-USB cable—aims to simulate a more-spacious sound, and it mostly works if you’re using the Mini Jambox as a personal speaker for one, with the speaker sitting right in front of you. (With the original Jambox, Live Audio made music sound dramatically quieter; that’s less of a problem with the Mini Jambox.) I enjoyed Live Audio mode when using the Mini Jambox at my desk, toggling it back to normal mode when I brought the speaker into the kitchen to provide the family with some dinner music. Besides the lack of substantial bass presence, the biggest knock against the Mini Jambox is that, in late 2013, what it accomplishes is no longer that special. Although the original Jambox, which debuted in 2010, impressed because of the amount of sound its creators coaxed from such a small package, such a feat is commonplace these days—you can find countless compact Bluetooth speakers (many of them inspired by the original Jambox) that put out big sound. Still, the Mini Jambox is even smaller, and it sounds nearly as good. That said, the Mini Jambox is a delightful little speaker. It sounds bright, clear, and punchy. While it’s not the speaker for a rollicking multiroom party, it works great around the house, as the soundtrack for a small gathering, for personal listening, and for allowing everyone crowded around an iPad to hear the latest viral video they’re watching. Should you buy the Mini Jambox? That depends. If you already own a regular Jambox, you don’t need this one. If you want true room-filling sound, the Big Jambox is the best Jambox. And plenty of great compact Bluetooth speakers are on the market. For example, Brookstone’s $100 Big Blue Live and $150 Big Blue Studio (rated 4 of 5 and 4.5 of 5, respectively) are both great values. The Live sounds a lot like the Mini Jambox, but is available at barely more than half the price. The Studio blows the Jambox out of the water with its larger design and woofer, but still costs $30 less. On the other hand, neither Big Blue speaker offers the portability or the built-in 10-hour battery that the Mini Jambox includes. So it really comes down to how much you value portability. For its size, the Mini Jambox is still quite impressive. If you crave portability and battery power, and if you are willing to sacrifice bass and volume to get them, the Mini Jambox is a solid buy. Updated 9/15/2013, 6:15pm, to correct comparison of Mini Jambox's size to that of the standard Jambox.